First off we want our customers to be 100% satisfied. If you are not happy with your purchase let us know. We will do everything in our power to make it right. If there is something wrong with your order such as shipping damage or a manufacture defect we will gladly take care of the problem at our expense. If we make a mistake, we fix it - no cost to you. Easy 30 Day Return Policy (most products). Free Ground Shipping on All Items shipped to continential US addresses. Easy cancellation (before product ships). Updated tracking information emailed out daily on packages. Liftgate and Inside Delivery available on most freight truck items. All orders ship UPS, FedEx, USPS or DHL with tracking numbers available. Claims for shortages, breakages or defects must be made within 48 hours. You must call and get an RA# (return authorization) to return an item. You have 30 days from the date the item is delivered to you to get the item returned to the ware house. Returns after 30 days can not be accepted. Some items we sell are hygenic products and may not be returned if the packaging has been opened regardless if it has been used or not. There are restocking fees on returned items that range from 30% to 35% depending on the vendor the item came from. You can cancel an order before it ships. There are no charges made for cancelled orders. Once the item ships it can't be cancelled or re-called, you will have to receive the package and then call for an RA# (return authorization number). Customers are responsible for shipping cost on returned items. ALL RETURNS MUST HAVE A RETURN AUTHORIZATION NUMBER ASSIGNED TO THEM BEFORE YOU CAN SEND THEM BACK. PACKAGES WITHOUT AN RA # ON THEM WILL BE REFUSED. You must call customer service at 1-800-804-9549 to obtain an RA # before sending the item back. Once an RA number is issued, the customer will have 30 days to send back the product. Returned items have to be returned in their original packaging, in new condition. They can't be scratched, damaged, used, worn, or otherwise un-saleable. Hygenic items can not be returned if the packaging has been opened. Custom made and built to order items are not returnable. This would include hospital curtains, stainless grab bars, PVC shower chairs and some wheelchairs. Items that are non returnable are usually marked very clearly on the website. The manufacturer has the right to make improvements to a product without notification. These changes are to better the quality and safety of the product and may include, but are not limited to design changes in color, shape, size or overall appearance. Claims for shortages, breakages, manufactures defects or any other reason must be made within 48 hours of receipt. Shipping containers must be kept if shipment is damaged or short. Our products ship by various methods. 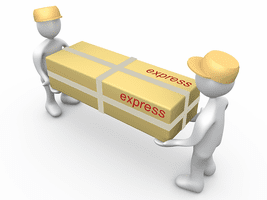 We use UPS, USPS, FedEx, DHL, freight companies and other delivery services as needed. We will always try to procure the most economical shipping possible for our customers to keep prices low. PLEASE CLICK HERE to see the full details of our Free Shipping program!